A few noisy, boorish right wingers could not mask the audience appreciation for Tim Farron's reasonable, moderate and generous-spirited message on Question Time on Thursday night. As has unfortunately become the norm, some over exuberant brexiteers booed everything he said. They showed themselves up. Tim was cheered for saying that we need a referendum on the deal. "You can't start a process with democracy and end it with a stitch-up," he said. But it was when he spoke out against Nigel Farage, that the audience really rallied to him. "However you voted on 23 June, Nigel Farage does not speak for that kind of Britain, he doesn't speak for the Britain I know." 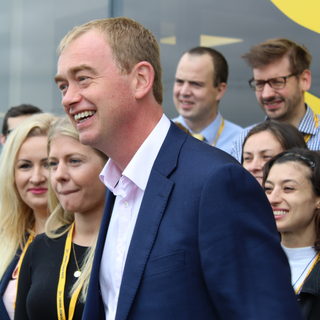 Highlighting his working class background Farron said: "I know lots of people who voted to leave the European Union and they are almost all of them outward looking decent, tolerant people who just happened to disagree with me on the 23rd of June. "Nigel Farage, the man who stoked racism and division in our country, does not speak for those people." Over jeers from some members of the audience, Farron added: "He might speak for you, but he does not speak for the overwhelming majority of the British people whether they voted leave or remain." He said that doctors should make people better not have to act as border security officials. He also flagged up the idea that if we want an NHS that meets our needs, we may have to pay more tax for it. On a question about Tony Blair coming back into politics, Tim said that though Blair had done some terrible things, he had at least built a coalition pre 1997 that beat the Tories and slammed the current Labour Party for making themselves the "most unelectable opposition in British history." There was some good commentary on Twitter, too. And this from someone who describes himself as a red-green member of the Green Party. You can watch the whole thing here..